.. 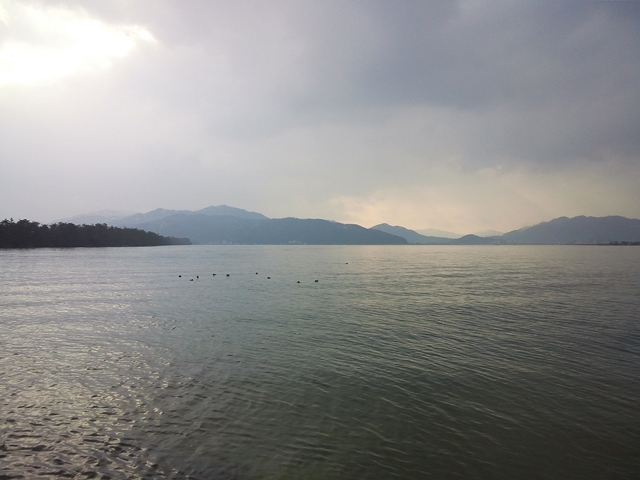 Approaching a shaft of light in the winter grey of the Japan Sea at Miyazu, I came across some wild ducks sleeping in a loch. The pine-clad isthmus, Amanohashidate (the Bridge of Heaven), stretched on, pointing towards Buson’s Temple, a rickety shack at the back of the town – Kenshōji 見性寺. .. With that image in mind, I stepped through into the precincts, soon to be greeted by resident priest, Umeda Jikō, gaunt and smiley. .. “Have you come for Buson?”, he asked. .. Shoes off – how cold the floor! Respectfully offering a prayer before the Amida Buddha there, we turned to an improvised display of things from Buson’s time in Miyazu, including two or three remarkable paintings – not haiga, but nanga – of what I took to be Chinese immortals. But which immortals? And why the mysterious plumes of white breath? Do they indicate a type of energy (qi 気) perhaps? Or it is just that the air was cold (seeing one’s breath)? For a moment, I focused in front of my mouth and … sure enough, my breath was visible, too! 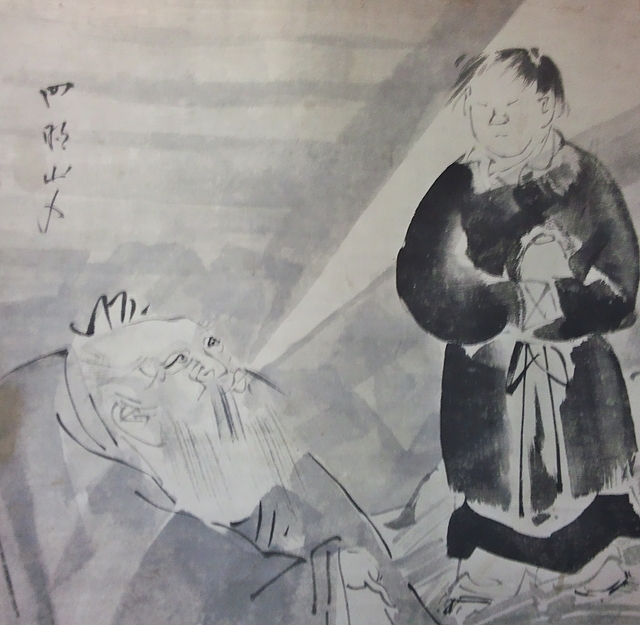 .. Buson had come to Miyazu in 1754, aged 39, to stay with his friend, the priest of Kenshōji, Chikkei 竹渓 (barefoot on left in the picture below by Buson). 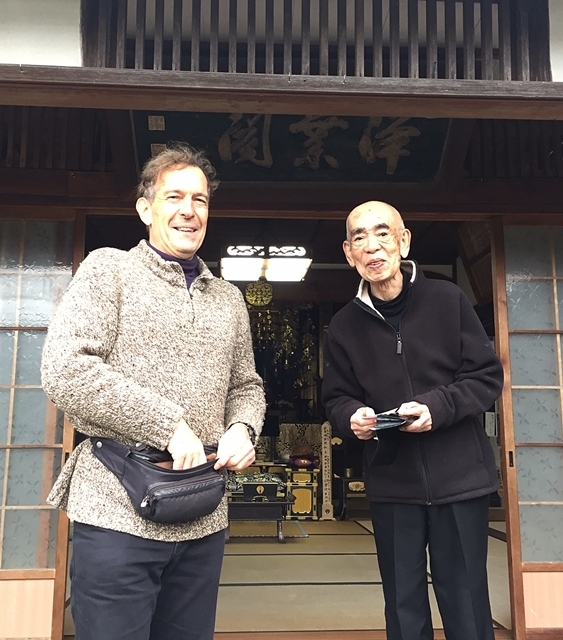 He spent much of the next few years there, participating in a haiku circle, changing his family name from Taniguchi to Yosa (a village by the Bridge of Heaven) and taking a local wife, Tomo, who soon gave birth to a daughter, Kuno. In Miyazu, he also developed his skill as a painter, turning to this profession when he eventually returned to Kyoto. I wondered if the assured brushwork of the paintings in the temple might just be that of a senior painter at the time, with whom he was studying. 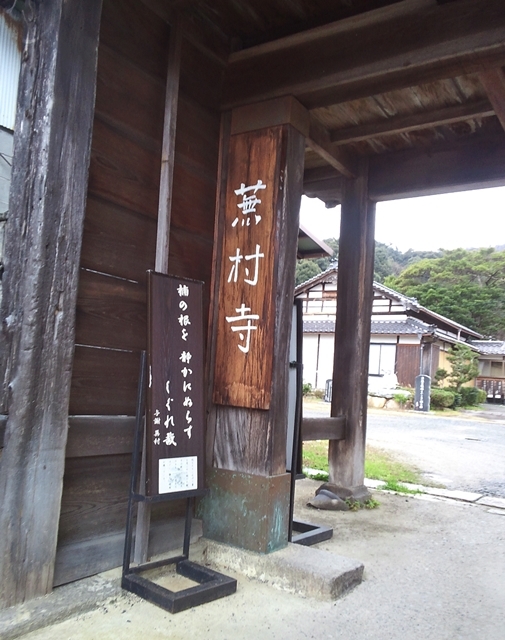 One of the paintings has a signature, the second character of which looked like the kei 渓 of Chikkei 竹渓, but the first is not recognizable and is surely not chiku 竹 bamboo. P.S. If anyone has an idea who the breathy mountain men are in the pictures, or who might have painted them, please leave a comment below. It didn’t seem as if Jikō himself was sure.